The non-metallurgical alumina market is diverse and complex and, over the past year, its main sub-sectors have been under pressure from rising costs and hiccups in supply, limiting availability of white fused, alumina hydrate and calcined alumina to the wider market, independent consultant, Ted Dickson, discovers. Although the non-metallurgical alumina industry plays a small part in the overall consumption of alumina, it is a diverse sector with many applications and an approximate total consumption of over 7 million tonnes during 2017 in terms of alumina content. Alumina hydrate or calcined alumina are the feedstocks for alumina chemicals and specialty calcined or fused alumina, with the exception of some of the very highest grades with 4N or 5N purity. The basic grades of non-metallurgical alumina produced at Bayer plants (the facilities that refine bauxite through the Bayer process, the most common production process for alumina) are wet hydrate, dried hydrate and normal calcined alumina. White or near-white hydrates are supplied from some plants, while low-soda grades of calcined alumina are supplied for more specialized applications. In some cases, calcined grades are effectively the same as metallurgical alumina, although specifications for non-metallurgical grades are often more demanding. Because of that and because volumes are much smaller, prices are higher than standard metallurgical grades by $30-40 per tonne. Low-soda grades will be more expensive, with grades under 0.2% Na20 (sodium oxide) about $100-120 per tonne higher and even lower soda grades, below 0.1%, considerably higher. Sales tend to be on a contract basis, frequently for a year, although multi-year contracts are also common. Total production or sales of non-metallurgical alumina reported as “chemical-grade alumina” by the International Aluminium Institute (IAI) amounted to 7.22 million tonnes in 2017, an almost 1 million tonne increase from the previous year. 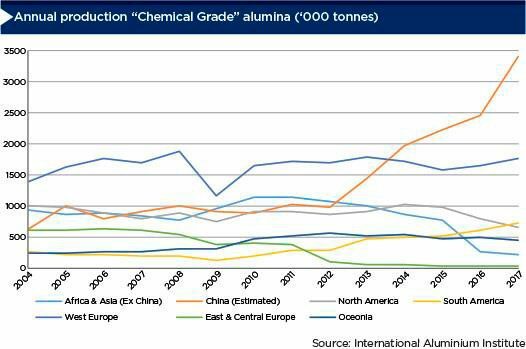 Most of the increases in chemical-grade alumina sales were in China, with increases also in Europe and Latin America but declines in North America and Asia, other than China and Oceania. The increases in Latin America reflect greater exports to the North American market, most notably for hydrate from Brazil, filling the gap in supply left after the 2016 closure of two major US-based alumina refineries, the Point Comfort and Sherwin Alumina plants in Texas. While there are anomalies such as much lower sales than realistic for eastern and central Europe, given Russian demand, the figures available from the IAI give a reasonable approximation of the overall situation and trends. After a significant fall in sales in 2009, chemical-grade alumina sales quickly recovered above pre-recession levels, although dipped again in 2012 and 2016. There was a significant increase in 2017, largely fuelled by China, and there has been strong demand from applications in sectors such as refractories, ceramics and flame retardants, globally. Non-metallurgical applications for alumina comprise those that use hydrates as the raw material and those that use calcined alumina, although there are some instances where alumina hydrate is purchased for calcination into speciality alumina grades. Total alumina hydrate use was estimated around 3.8 million tonnes in 2017, according to TAK Industrial Mineral Consultancy. In alumina content this is equivalent to about 5.85 million tonnes of gross weight. The largest use is for the production of water treatment chemicals. Total use of alumina hydrate in water treatment chemicals is estimated to be 1.75 million tonnes of alumina content, equivalent to about 2.7 million tonnes gross weight. Wet filter cake from Bayer alumina plants is the primary raw material. Markets for water-treatment grade chemicals tend to be regional. This is because, while consumers want the alumina content, over a third of the gross weight of wet hydrate is water of crystallization as well as free moisture, making it uneconomical to move over long distances. Yet, with the two plants closed in the US, consumers turned to Brazil to source raw material. Up until 2013, Brazilian exports of alumina hydrate had primarily been to Japan but, in 2014, exports to the US rose to more than 74,000 tonnes. Exports to the US continued to escalate and by 2017 overtook Japan at around 380,000 tonnes per year when exports to Japan fell from their 2016 peak of 443,000 tonnes. Water treatment chemicals is the largest main end-markets for hydrate use, followed by aluminium fluoride, flame retardants and zeolites. The water treatment chemicals business is mature in developed nations, where modest growth rates are in line with population trends, possibly no more than 1-2%. So there is greater potential for growth in developing nations, but this should be slow due to a relatively low starting base where countries require major growth in water delivery infrastructure. Bauxite is still used directly to manufacture these chemicals. All European manufacturers now produce exclusively from wet hydrate feedstock. Two producers in the US are still using some bauxite, primarily low iron bauxites from Guyana, and there are still considerable amounts of water treatment chemicals manufactured from bauxite in China and India using local sources of raw material. Aluminium fluoride production is the second largest use of wet hydrate. In this case, the force majeure situation at Brazil’s Alunorte has not posed so much of a problem with supply because North American production has come from aluminium producers using hydrate from their own Bayer plant to produce with purchased fluorspar. Essentially, these producers are vertically integrated because they are also the customers for the aluminium fluoride in their production of aluminium metal. Growth in the aluminium fluoride sector has been strong in the last decade at over 5% CAGR on a worldwide basis driven by over 10% growth in China and more than double demand in that period. Demand will depend on aluminium production growth with an almost direct relationship between the volume of aluminium produced and aluminium fluoride demand, with minor reductions being more efficient production methods, reducing aluminium fluoride requirements per tonne of aluminium. Flame retardants is another fast-growing sector, posting rates of 3-6% per annum depending on the region. Current production is estimated to be 800,000-850,000 tonnes, which will have an alumina content of 520,000-550,000 tonnes. It includes white or near-white Bayer hydrate and fine re-precipitated hydrates – for the latter, there is added value from the Bayer hydrate when used as the raw material. The finished product is sold at 2-3 times the cost of wet hydrate for ground white Bayer and more for fine precipitated grades, with some special grades over $1,000 per tonne. As regards zeolites, total consumption of alumina hydrate in this application is estimated at less than 400,000 tonnes, representing 260,000 tonnes in terms of Al2O3 content. The zeolites market has retreated from its peak after the end-user shift from powder detergents in Europe and North America, although large volumes remain in Eastern Europe and Asia. There are additional markets for zeolites in things such as fluid cracking catalysts, adsorbents or desiccants. Growth rates are expected to be relatively modest at perhaps 1-2% per annum, reversing declines over a number of years while the loss of detergent markets seems to have matured. 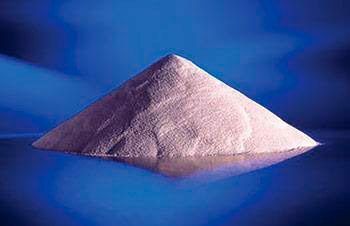 There are many uses for calcined alumina feedstocks from Bayer plants, although in aggregate the largest consuming sector is refractories. 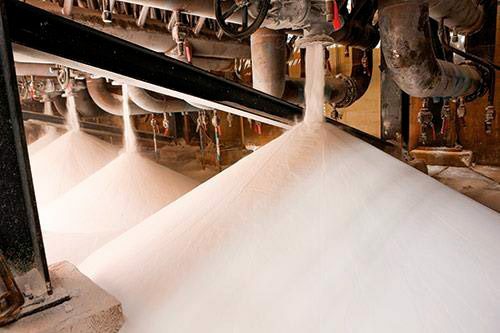 Total consumption of feedstock calcined alumina used for specialty grades or derivatives production is estimated around 3.2 million tonnes, according to TAK Industrial Mineral Consultancy. 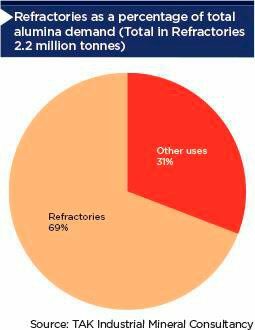 Of that, about 2.2 million tonnes or close to 69% is for refractory applications. Direct use of calcined alumina in refractories is estimated to be 800,000 tonnes. Tabular alumina production is estimated around 700,000 tpy, white fused alumina production for refractory applications is at 270,000 tpy. Tabular and WFA are often in direct competition because they are alternatives in certain applications. For calcium aluminate cements (CACs), calcined alumina is used to produce 70-80% alumina grades. 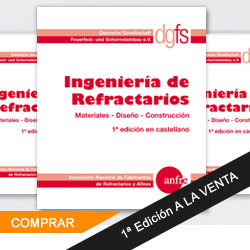 CACs are almost exclusively used in refractories. Based on the 120,000 tonnes of alumina used for CACs, this equals a total CAC production of 150,000-160,000 tonnes, with most production concentrated in Europe. The refractories markets were strong in 2017 after a stuttering recovery from the 2009 recession when volumes dropped significantly. That strength has continued into 2018 and major companies such as Vesuvius, RHI Magnesita, Imerys refractories division and MTI are all reporting strong sales. Part of the sales increases is due to escalating prices for some raw materials filtering through, as well as increases in volumes. Despite issues concerning the possible imposition of 25% tariffs on imports of some Chinese commodities to the US, the steel industry, by far the largest consumer of refractories at 60-70% of total consumption, has been a strong and resilient market recently. Crude steel production, which is the best measure for refractories demand, increased 4.6% in 2017 worldwide, with a forecast for a further 1.8% growth in 2018, according to Metal Bulletin Research (MBR). The growth has been widespread, with few countries stagnating or decreasing. Total global growth for 2019 is predicted by MBR at 2.5%. Local steel demand in China is expected to remain fairly strong despite the impact of environmental restrictions. 2019 is expected to be a strong year for growth in European crude steel production as well. Sanctions on US steel imports appear to have little effect on the overall market. US prices for steel from domestic producers have increased by 25% or more, so the 25% import duty is maintaining the net price that importers can achieve. Some idled steel capacity may return to production because increased prices mean they can be competitive again. But short term, duties should not affect the US or world production, with few exceptions such as Canada, the largest exporter to the US, which should experience a decline in sales. The ceramics sector, which covers everything from grinding balls to high-tech ceramics, is also rapidly evolving, with growth in 2017 and 2018 up to 4-5%. Other sectors such as catalysts, polishing and WFA for abrasives should increase, but maybe below current growth rates for refractories and ceramics. Specialty grades have considerable added-value compared to the calcined Bayer alumina feedstock, with prices usually in the range of $700-1,500 per tonne, or higher for niche market grades. The alumina hydrate supply situation for both the US and Japan changed dramatically in 2018. Following heavy rains in Brazil, there were fears that the tailings dam at the Alunorte Bayer alumina plant could overflow, though it did not. Yet, the company was instructed by Brazilian Environmental authorities to reduce production at its plant by 50%, effective from March 2, resulting in the loss of about 3 million tonnes of alumina supply. Alunorte is the largest alumina refinery globally, and had been the main exporter of hydrates from Brazil, significantly affecting supply to Japan and the US. As a result of the problems in Brazil, Southern Ionics, the largest US importer, was affected as regards its alumina-hydrate-based products. Hydro Aluminium did assist Southern Ionics to obtain further supplies on a monthly basis by purchasing smelter-grade alumina and swapping it for hydrate from other suppliers so that much of the ATH requirements were met, but at higher prices. The Alunorte plant was expected to return to normal operations quickly, but that has not been the case. With no guarantee the plant would return to full capacity, and because Hydro asked Southern Ionics to reduce volumes in future planned shipments, Southern Ionics had no alternative but to declare force majeure, effective June 19. The company said it was confident it would source sufficient alumina hydrate from other suppliers to serve its customers, although at a higher price. The alternative sources were not revealed. 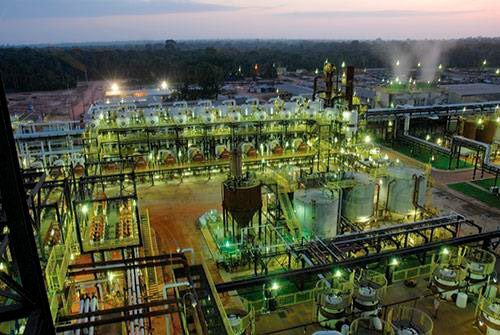 There is no apparent resolution to Alunorte’s reduced capacity problem, and with no official announcements, industry sources believe there will be no meaningful development until after Brazil’s general elections in October. Meanwhile, hydrate supply in the US and Japan is tight. Alternative sources are being pursued, with Japanese consumers looking to Australia, their second major source of hydrates, and possibly China. Noranda’s Gramercy plant is already expanding its capacity for hydrates by installing additional filtration equipment and has completed the first phase of expansion with the second phase due soon. Sources in Jamaica and elsewhere have been investigated, but without filtration equipment in place it is difficult to react quickly enough to fill the Alunorte gap. Producers in Europe have reported inquiries for hydrates from both the US and Japan, but in general they are working at high capacity and all product is allocated to existing contracts. This means they are in no position to supply in 2018 and probably 2019. The US’ threat of sanctions against Rusal caused further anxiety in the overall alumina market, although the company’s involvement with supply to non-metallurgical applications outside of Russia is limited. With Oleg Deripaska, who was the target of sanctions, stepping back from his involvement and reducing his ownership of Rusal, sanctions that were delayed until October may not take effect. There is still uncertainty, however; and the perception that there may be sanctions has meant some companies, particularly those US-based or with extensive US interests, are trying to avoid doing business with Rusal until there is more clarity. There are several issues influencing prices in current market conditions. Apart from the Alunorte/Rusal concerns, production costs are rising rapidly. Caustic soda, a significant part of the cost of processing bauxite to alumina hydrate, has essentially doubled in price in the last year. Energy, another significant cost factor (especially for calcining the hydrate to smelter grade or non-metallurgical grades of alumina), has also increased significantly. Freight costs for the delivery of raw materials such as bauxite to the Bayer plants or product to customers are similarly increasing, much like labor costs in many regions. All of these factors are contributing to upward pricing pressure. Most non-metallurgical alumina consumers tend to contract for a year or more, although price negotiations may be on an annual basis for multi-year contracts. The general indication is that prices in 2019 should rise by double-digit percentages of possibly 20%, maybe more. Some US consumers already had mid-year price increases of 10% and there are indications that there could be more before the end of year. Few, if any, contracts have been agreed based on a link to an alumina index price, which has become the norm for third-party sales of smelter-grade alumina by alumina producers, many of whom are vertically integrated. Consumers of non-metallurgical grades from Bayer plants can’t normally manage the fluctuations in index prices because they cannot easily pass increases on to their customers for, say, water treatment chemicals or specialty-alumina. Over 2018, the alumina index price has been particularly volatile. On March 20, the Metal Bulletin index was sitting at $374.50 per tonne fob Australia, but increased soon after to over $450 per tonne, largely attributed to the developments at Alunorte at a time when the smelter-grade alumina market was tight. When sanctions were placed against Rusal, some suppliers and customers invoked force majeure clauses, creating a bigger price spike and for a brief period going over $700 per tonne. With sanctions delayed, the index quickly moved down, falling to almost $440 per tonne before rebounding to $527 per tonne at the beginning of August, an approximate 40% increase from the price at the beginning of March. While consumers of non-metallurgical feedstock grades of alumina will resist a move to contracts linked to index prices, the price of smelter-grade alumina certainly affects the contract price for these consumers. Consumers are expecting an index price of about $450 per tonne during negotiations for 2019 contracts, an approximate 20% increase over the fourth quarter of 2017 when many 2018 contracts closed. With Bayer alumina production costs increasing, there is market acceptance that prices will rise. Yet consumers wish to insulate themselves from short-term volatility. As well as increased production costs for Bayer alumina, producers are attempting to improve margins, which many feel have been too low for too long. Another factor to consider in the next round of contract negotiations is the strong smelter-grade alumina market, so there will be greater competition for product. As usual, non-metallurgical alumina consumers have to contend with Bayer alumina suppliers that favor smelter-grade sales when demand is high. The negotiation period for non-metallurgical alumina feedstock contracts in 2019 is likely to be a worrying time for consumers. If the situation at Alunorte in not resolved, North American hydrate consumers may opt for alternative sources if available, even if prices are higher. Some may risk waiting to see if Alunorte resumes full production, in the hope that contract prices will increase less than might otherwise be the case. Prices for specialty alumina and products derived from hydrates are also likely to rise on additional raw material costs, possibly reaching the levels of the increase in feedstock grades.